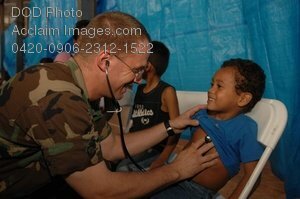 Description: Free, public domain image: Military Medic Gives Treatment to a Child in Panama. A crew member from the Military Sealift Command hospital ship USNS Comfort (T-AH 20) gives medical treatment to a patient May 26, 2009, at the Puerto Pilon Gym in Colon, Panama, in support of Continuing Promise 2009 (CP09). CP09 is a four-month humanitarian and civic assistance mission that will provide medical and other services in seven countries throughout Latin America and the Caribbean. (U.S. Air Force photo by Senior Airman Jessica Snow/Released.